I think they’re fair comments. I think we had a bad start to the second period. I thought we let them get going there a little bit. I think that again, it was a game that we got a power play in the third, we didn’t get anything on it, they got a power play goal. It seems like a little bit of the same story. I think they certainly had the breaks going their way tonight. They got probably three that usually don’t go in. Saying that, that was a game like the last game that we felt like we had a good chance to win. But it wasn’t that – they had three that period that were just different goals that usually don’t go. So, it was a night where it seemed like we were pushing but nothing was happening. But, saying that, I thought our young guys played pretty well tonight. That was a big goal by Clifford at the end of the second to get us back in it, so we did have some good things from our younger guys. Yeah, he’s a good hockey player. He’s hard on himself, too. It’s not like he’s sitting there and he’s not hard on himself. He’s had some chances, they haven’t gone in. It’s more of a concern when you have a goal scorer that’s not getting chances, but he is getting some chances. Saying that, we mixed our lines up a little bit tonight. We were looking for something different to get us going. It’s not good enough to be close. Like, we have to find a way to be better, and the guys know that. Yeah it was, and it was late in the kill. We had the thing just about killed off – probably 10, 11 seconds left on the kill and they scored. But, yeah, it seems like every night that’s happening to us. Like, our five-on-five game hasn’t been awful. It can be better, but it hasn’t been awful. We still have to find a way to our specialty teams. Just playing in their zone and getting pucks on net and converting on them. There wasn’t too many pretty goals out there on both sides. The game sometimes goes that way, and obviously we scored some goals, but gave up too many chances, too many opportunities to win the game. Usually when things go wrong, it’s bounces that definitely don’t go your way, but you’ve got to create your own luck really, too. So we’ve just got to be more intense. Bottom line, just get the job done. I’m sure we’re going to watch some video and correct stuff for sure and get ready for Vegas. Well, it gets harder with each and every loss really. You did a bigger hole every night and it’s harder to get out of it, like you said. When things don’t go right everything’s going wrong against you, but then again it’s up to us to come out of that hole. We’re obviously super frustrated. Another game that we didn’t perform well enough. I don’t know if we even hit the 20 shot mark. It’s frustrating, it’s embarrassing, it’s a lot of things. I just don’t see enough emotion from the entire group to get us out of this. It’s not going to take three or four different guys every night. It’s got to take the entire group and I know that no one’s seeing the emotion out there. I’m sure you guys can see it from up top. We’re playing with a lack of emotion, and that’s the bottom line. Yeah, but tonight we responded all right. We did get a goal almost right away after it felt like after they got theirs. Just once they got up 4-2 it took us a little bit to get back in the game and then obviously it just snowballed from there. But I do feel like we did respond a little bit better in the first two periods anyway, but it’s still not good enough, that’s the bottom line. Lost another game, gave up another five or six goals or whatever it is. I don’t really have too much to say. Just it’s pathetic, it’s embarrassing, it’s frustrating. It’s one thing to lose games when guys are competing. You can live with that. And you can live with doing good things, but when we’re not doing well and we’re not competing, you can’t live with it, and we haven’t lived with it since it started happening. It’s going to take everyone to get us out of this, not just three or four guys, like I said. No. You see some guys playing physical and the bottom line is that the Kings have to be a physical hockey team. We’re not as skilled as the other teams, that’s just the bottom line. We have to be physical team. We have to be a hard team to play against. We have to have teams come in here and be like, ‘Oh no, we’ve got to play the LA Kings again in their arena,’ you know? I don’t see enough physicality from our team. I don’t see enough compete and that’s why we’re losing these games to teams that are fighting for the last spot with us in the standings too. I’m not talking about New Jersey necessarily, I’m talking about other teams, but how we’re losing to these teams. It’s not acceptable. –With the loss, Los Angeles fell to 55-34-15 all-time against the New Jersey franchise, a record that includes a home mark of 31-13-8. The Kings are 3-6-2 in their last 11 home games against the Devils. These teams have one game remaining: February 5 at Prudential Center in Newark, N.J.
–With the loss, Los Angeles fell to 5-7-0 against the Eastern Conference, 3-3-0 against the Metropolitan Division, 3-5-1 in one-goal games, 1-16-1 when their opponent scores first, 6-7-0 when tied after one period, 0-14-0 when trailing after two periods and 7-11-1 when outshot by their opponent. –Since their 1967-68 inaugural season, the Kings (10-18-1) have accumulated 21 or fewer points through 29 games seven times: 1969-70 (6-20-3), 1970-71 (8-16-4), 1971-72 (6-22-1), 1983-84 (7-16-6), 1985-86 (7-18-4), 1987-88 (7-18-4) and 1998-99 (8-18-3). –Over the last 14 games, dating back to the home loss to Minnesota on November 8, Los Angeles has gone 4-for-38 on the power play and 29-for-45 on the penalty kill. —The Kings fell to 4-17-1 when scoring three or fewer goals this season. Los Angeles also conceded six or more goals for the third time this season. –Drew Doughty collected his 334th career assist, surpassing Rob Blake for first on the Kings’ all-time assist list by a defenseman. Doughty is also one game shy of 800 career NHL games (including a franchise record 357 consecutive games) and remains one game-winning goal shy of breaking into the Top-10 in franchise history. –Taylor Hall collected three points for the Devils and has now tallied a point in 18 of 27 games played this season. Hall increased his team-leading assist total to 22, tied for 16th in the NHL. Hall’s three-assist effort was his first since March 27, 2018 and marked his seventh multi-point game of the 2018-19 season. –The Kings attempted 57 shots (32 on goal, 12 blocked, 13 missed). The Devils attempted 62 shots (35 on goal, 17 blocked, 10 missed). Kyle Palmieri and Sami Vatanen led all skaters with six shots on goal, while Kyle Clifford and Dustin Brown led the Kings with four each. –Los Angeles won 33-of-79 faceoffs (42%). 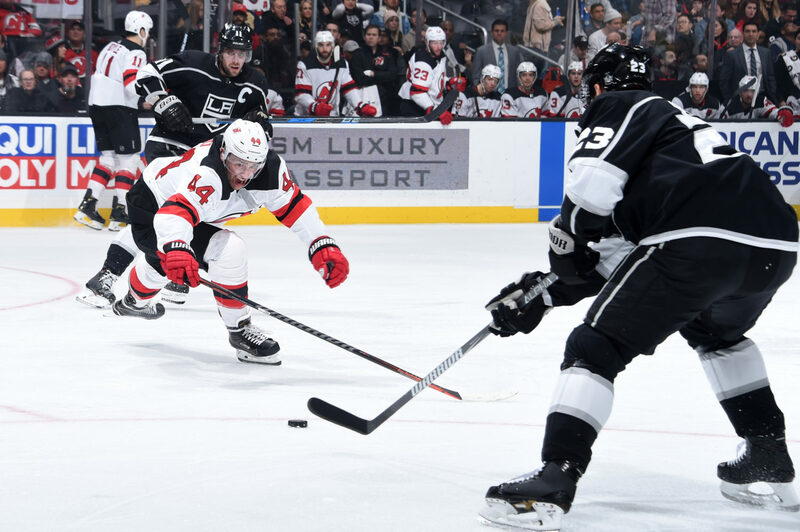 Nate Thompson won 5-of-8, Anze Kopitar won 16-of-31, Adrian Kempe won 6-of-15, Jeff Carter won 5-of-17, Michael Amadio won 1-of-4 and Dustin Brown, Alex Iafallo and Brendan Leipsic each won 0-of-1. The Kings have lost the faceoff battle in in 7 of the last 24 games.